Fully understanding the theoretical approaches in standards such as ISO 9001:2015 is often quite challenging - particularly when one does not have existing knowledge in the area of quality management. The contents may appear rather abstract and it is difficult to apply them to one’s own workplace setting. But how do you spice up these topics and make them more accessible? 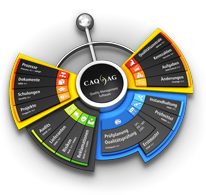 In order to achieve this, our partner company GFQ Akademie GmbH came up with a ground-breaking new concept in which it combines the teaching of ISO 9001 with the most elemental and comprehensible aspects of everyday life: cooking and food. This seminar brings together the GFQ Akademie’s experts in quality management and renowned master chef Detlev Ueter in order to convey the basics of ISO 9001:2015 in conjunction with the hands-on preparation, execution, and subsequent analysis of a 4-course meal. Join us and learn how to put the contents of this global standard into practice and understand how to apply it to your company and workplace. Bonne Appetite!